The paper describes flow control techniques viz. vane-type vortex generator (VG) array and rear-spoiler on its trunk (boot) side used to reduce drag of a passenger car. 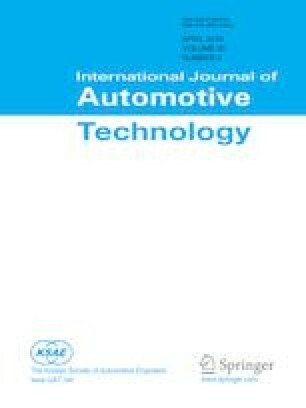 The experimental and computational studies were carried out and different cases and combinations were analyzed for the car model by varying incoming airflow angle and spoiler angle and orientations of VG array to find out the optimum conditions for which drag coefficient is found minimum. Shear stress transport (SST) k-w turbulence model is found suitable in predicting the multi-scale rear-wake vortices of the car geometry. It is found that the crossflow increases the drag coefficient, which can however be reduced effectively if both VG array and rear-spoiler are used. Parametric analysis shows that counter-rotating VG array is found useful in reducing drag (around 23 %) as it promotes better flow mixing at its downstream, which is helpful in avoiding flow separation. The finding is also supported by the flow visualization study. It is also found that saving up to 11.5 % in the fuel consumption can be achieved by reducing drag using these techniques. The wake analysis and turbulent kinetic energy plots indicated that the counterrotating VG array while used with a rear spoiler parallel to the flow reduced drag considerably.